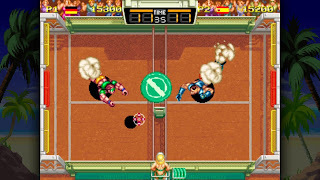 Originally released on the Neo Geo, Windjammers never got the hype it was looking for until many years later and now with its release on PlayStation 4, can it reignite its fire once again? Originally released on the Neo Geo, Windjammers is a fast paced sports game that tests your wits and reflexes as you strive to outdo your opponent and come out on top. This is done by throwing the disc into the opposing goal. The goal is split into 3 sections where scoring in two of them grants you 3 points and the other 5 points. There are two sets to each game and a set ends once a player reaches 12 points. This is the basis of Windjammers gameplay, but as you can imagine there is a much bigger reason as to its been brought back for a new generation and that's what it does to make things more exciting. The disc itself can be thrown straight on or rebounded against the walls to make things a little trickier. You can also curve the disc to really get in your opponents head or go for a lob to catch them off-guard instead. You can also perform power moves by charging up when the disc is airborne. The power move does differ depending on who you pick and believe me, some of them are really difficult to anticipate. There are six characters to choose from and each differ in terms of speed and power, allowing you to choose the play style that suits you best. I personally went for a balance of the two as it let me get to the disc when it felt out of reach, while at the same time being able to put enough power behind it, to put points on the board. 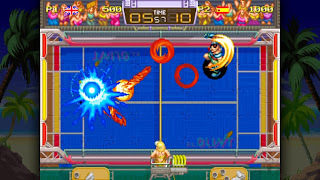 The great thing about Windjammers is that anyone can pick up and play it, yes it does require a small understanding of the mechanics which is greatly explained in the "How to Play" section, however as the control scheme only goes as far as movement with the joystick and throwing the disc with two buttons, I'm sure most will be able to pick it up relatively quickly. Pretty sure of your disc throwing wizardry? Well there is an arcade mode where you can play in a tournament against the CPU to be crowned Windjammers champion. The difficulty can be set here if you really feel like challenging yourself and believe me, it can be really challenging if you suddenly become smug and decide to set the CPU at its hardest. There is also online play available and while I wasn't able to get in many matches, the games I did manage to play ran smoothly and was fun overall. 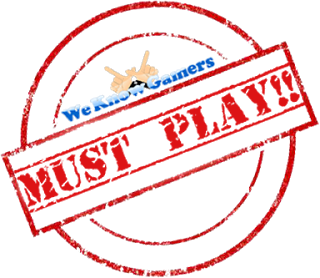 You can jump into a quick match, play against a friend or test your skills against the best of the best in Ranked Match. Wins gain you points and put you on the leaderboard. Lastly if you want to take a break from the constant back and forth, there are two minigames available where the first is practically bowling, but with a disc and the second one you control a dog on a beach who is chasing after a flying disc. Avoid as many obstacles as you can and look out for those sunbathing on the sand. I honestly did find the mini games to be a little flat and felt that with this re-release, they definitely could have expanded on them. While they were interesting initially, after the 3rd go I really got bored of them and couldn't wait to get back into the real stuff. 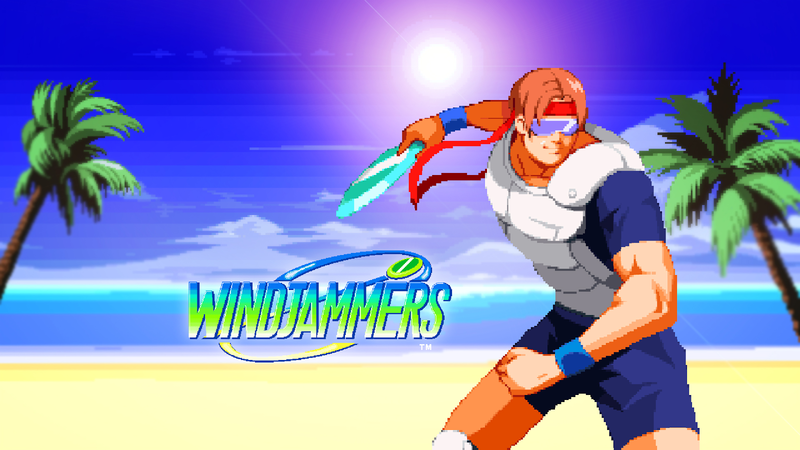 Windjammers may not be everyone's cup of tea, however I found the game to be absolutely addictive and wouldn't be surprised to see it show up on the eSports circuit sometime in the future. Its fast paced action make it a pure adrenaline rush and could be really hype for audiences watching.